We've just driven the lovely C 63 AMG in Portugal and have come away super impressed. 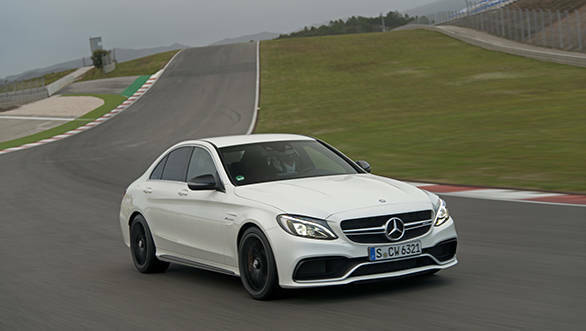 The new C 63 is quite important for Mercedes-AMG with the last one being the most successful car in their history. This time around, there are two cars available- the base C 63 with 476PS and the top C 63 S with 510PS. The S also gets larger wheels, an electronic locking rear differential and a Race mode in addition to the other driving modes that include Comfort, Sport, Sport Plus and a customisable Individual. 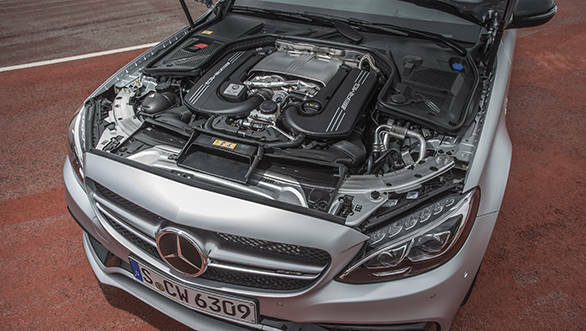 So how well does the new car stand in the three critical points it takes to make an AMG? Let's start with the most important. The previous C 63 AMG ran the iconic 6.2-litre V8 that produced big power and a thunderous noise - the calling card of any good AMG. The new car, however, features a considerably smaller 4.0-litre V8 that uses two turbos to produce both more power and torque than before. The turbos are nestled in the V which helps in packaging. Significant improvements in heat management and the use of low friction materials have also resulted in better efficiency - Mercedes claims up to 12.1kmpl for the base C 63 and 11.9kmpl for the C 63 S. Although we were seeing about 6kmpl on the dials, which is actually reasonable for the kind of power generated and how naughty we we were with it. 510 horsepower is a massive number for a compact luxury saloon but what really shines about the new V8 is how wonderfully linear and tractable it is. There's 700Nm of torque available from 1,750-4,500rpm which means you simply have to prod the throttle in any gear to produce some serious speed. Power simply builds and builds all the way to the redline at 7,000 rpm. There are no surges or holes anywhere in the rev range and you'd never guess you're driving a turbo engine except for the faintly audible whoosh at high revs. It's a fantastic engineering accomplishment and the best turbocharged engine I've experienced yet. Best of all, it makes a delicious roar when you have the exhaust flaps open. The car comes with a sports exhaust as standard that allows you to open or close a flap situated at about the one-third length of the exhaust system.. However there's an optional exhaust that has two more butterfly valves just short of the end of the exhaust on either side. This optional pipe produces a smooth V8 burble with the valves shut and a raucous roar when open. It also generates lovely bangs and cracks on lift-off or hard gear changes. It's the first option you should tick on the list. This is the same engine that debuted in the achingly handsome AMG GT, although the version in the C-Class interestingly produces more grunt - 12PS more in the base variant and 50Nm more for both the base and S variants. Mercedes claims that the lighter AMG GT simply doesn't need the extra power right now. Unlike the AMG GT, there's no dual clutch transmission but a thoroughly revised version of the single clutch 7-speed AMG Speedshift MCT 7. Quick and intuitive gearboxes aren't a traditional Mercedes-Benz strong point but the new box has significantly upped its game. It's smooth and fast both on the road and track and gives you rev matched downshifts as well. There's a launch control mode too but the power quickly overcomes the 265-section rear Michelin rubber and the traction control repeatedly cuts in while the gearbox short shifts in the first couple of gears. It's not the most effective or elegant solution we've seen and wider rubber would have probably helped. Nevertheless, the gearbox's overall performance is highly impressive and I'd rate it an 8 out of 10. It's very good but doesn't quite have the eye popping speed and precision of rivals like Porsche's PDK. AMGs have a reputation for being high power hot rods that are also good fun on a series of bends. The C 63 is exactly the same. On the road, it's a monster that devours straights frightfully fast but also feels utterly calm and composed cruising north of 170kmph. However, we had the pleasure of driving the C on the gorgeous Portimao racetrack where the car really put huge smiles on our faces. Of course, there's the massive power that gets you to nearly 250kmph at the end of the main straight but it's only once those lovely corners and endless crests and dips arrive that the C really starts to excite. Race mode puts the electronically adjustable dampers in their firmest setting as it does for the electronic steering. The gearbox sharpens up and the traction control goes to Sport Handling mode that allows a wide slip angle before the electronics step in and make sure you arrive at the next corner. The car feels agile and eager to turn in, even though it's not ultimately as stiff as a focused sportscar. You can also feel the electronic differential helping the rear tyres bite in and power you out of corners when you're aiming at high speed laps instead of provoking the rear to break loose. Our track cars were fitted with optional ceramic brakes that were powerful but progressive while standard steel brakes felt perfectly balanced between power and feel on our street drive. What I loved most about the C 63 on the track is how progressively the rear breaks into a slide. You can plan it perfectly - turn in hard, boot the throttle and 'wheee! ', all with the comforting knowledge that TC will catch you if you're not quick enough. You know a car is fun if you enthusiastically pat the steering wheel in gratitude when the drive is over. The C 63 got many pats that day. Portugal has pretty decent roads for the most part but on the occasional rough spots we encountered, the car felt firm but not unreasonably so. The C 63 comes with 18-inch wheels as against the 19-inches on the C 63 S. The higher profile tyres meant slightly better ride and Mercedes will do well to bring the C 63 S (we only get the top model) with the smaller wheels. 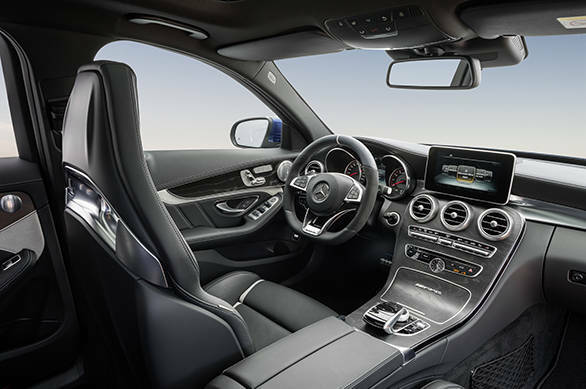 The new C-Class is a mature, elegant design and AMG builds on that. The bumper has larger intakes to feed the front mounted charge air coolers while the hood features a muscular bulge. The front-wheel arches have been flared by 14mm on either side and while the wheelbase remains the same, the front section has been lengthened by 54mm to house the larger engine. 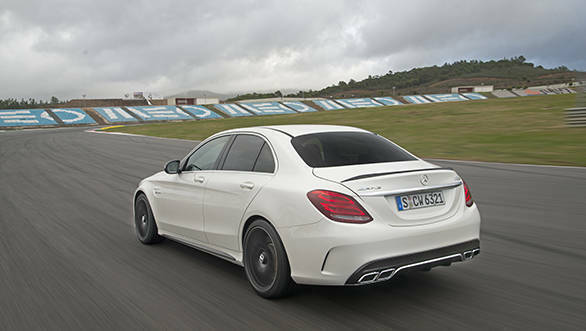 The rear remains largely the same save for a wider bumper that houses the traditional four pipe AMG fake exhaust tips. There's also a small lip spoiler that's angled almost like a gurney flap, which AMG says helps improve downforce without blocking road users from seeing the third brake-light mounted at the base of the windscreen. Fans of restrained sportiness will love how it stands out just the right amount but a lot of people see its lack of gaping intakes, various air scoops and big spoilers as a bit of a downer. It's not really a problem but if we were to pick nits then the C 63's reserved sportiness is perhaps one of its only negatives. The reason we love this car so much is that it's massively powerful but also very usable. 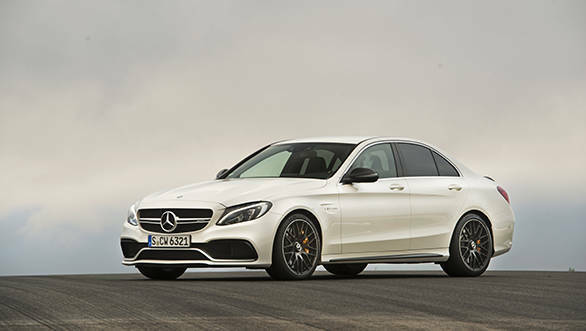 It's compact and nearly 300kg lighter than the larger E 63 AMG. It's an absolute pleasure to drive no matter whether you're on maximum attack on the Autobahn or destroying the rear tyres on a racetrack. The C 63 AMG costs about Rs 65 lakh in the UK so when you double that to account for our tax and duty structure, you're looking at a price between Rs 1.25-1.3 crore when it lands in India. Mercedes plans to bring the car here out in the third quarter around the festive season. However, the standard C-Class sedan got such rave reviews that Mercedes actually launched the car three months earlier than they planned. 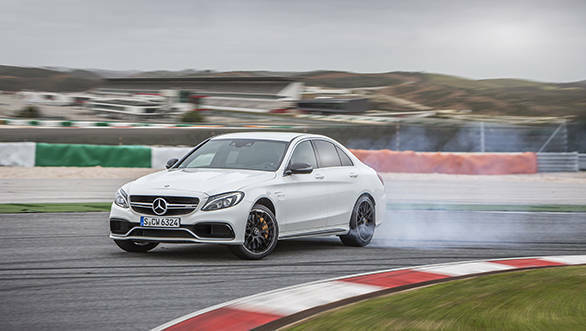 So don't be surprised to see the C 63 AMG shredding its rear tyres on our streets in the next few months.